Omg!!!!!!!!!!!. . Wallpaper and background images in the 刺猬索尼克 club tagged: sonic amy tails shadow knuckles rouge. more like the sonic bros. The princesses are UGLY! :P Peach & Daisy r AWESOME! 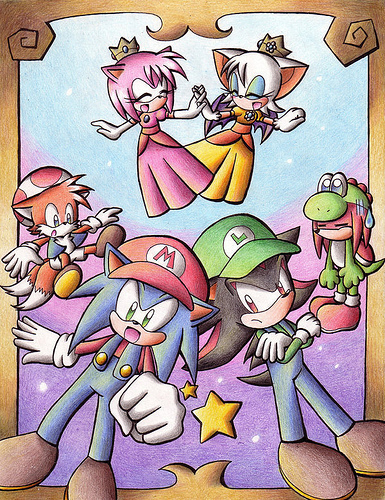 thats funny especially knuckles in the yoshi costume.haha sonic gets to ride on knuckles like mario does to yoshi. 0_0, SONIC, WHAT THE HELL IS UR PROBLEM!!!!!!!!!!!!!!!!!!!!!! DONT STEAL MARIOS PLACE!!!!!!!!!!! !